It's a confusing world we live in when someone like Gene Simmons draws swarms of female fans whenever he and his bandmates schlep into town to do a show. 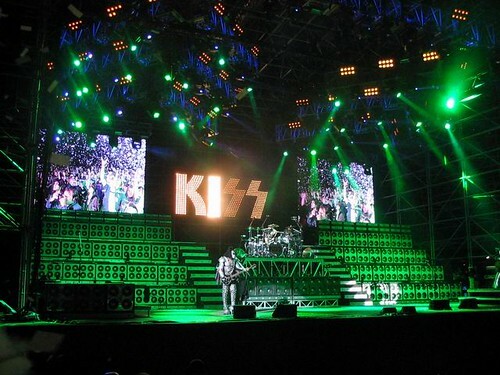 The Kiss Alive 35 tour has included stops in places like Columbia and Russia as well as the United States. I have no idea what the attraction is, but adoration is rarely logical. Almost everyone can understand what it's like to impetuously fall for a scalawag, or have an irrational crush. Most everyone can relate to the rancid pain and intense suffering of being futilely smitten. This explains the success of the romance novel. In spite of all the derisive comments, criticism, and belittlement of the genre, romances provide catharsis for the lovelorn and entertainment for armchair fortune-hunters, selling more in North America, and checking out from libraries in larger numbers than any other genre. On his television show Family Jewels, Simmons once stated, "The modern world has been robbed of romance." It was an interesting choice of words; if robbery implies being denied of something against one's will, there may be something romantic behind his gruff exterior after all, and adopting a cynical, crude persona for the public becomes a way for Simmons to keep his tender side (however trifling) private.